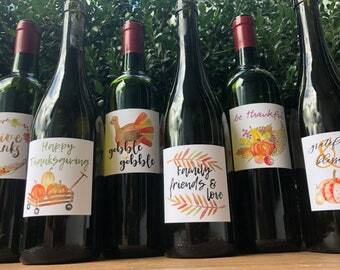 These Kraft Bunny Tail Wine Labels could be the perfect addition to your Easter Table OR use them as a hostess gift on Easter! These labels have also been used for baby showers. 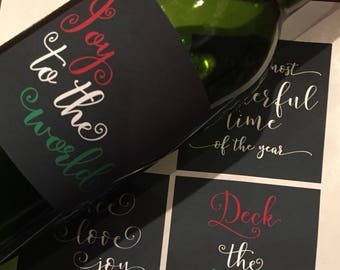 What's a better gift than wine? Everyone will fall in love with these ADORABLE Bunny Wine labels! ADD a special touch to a great gift for family, friends and teachers! It's all in the details! A POMPOM Bunny Tail is glued onto the label! 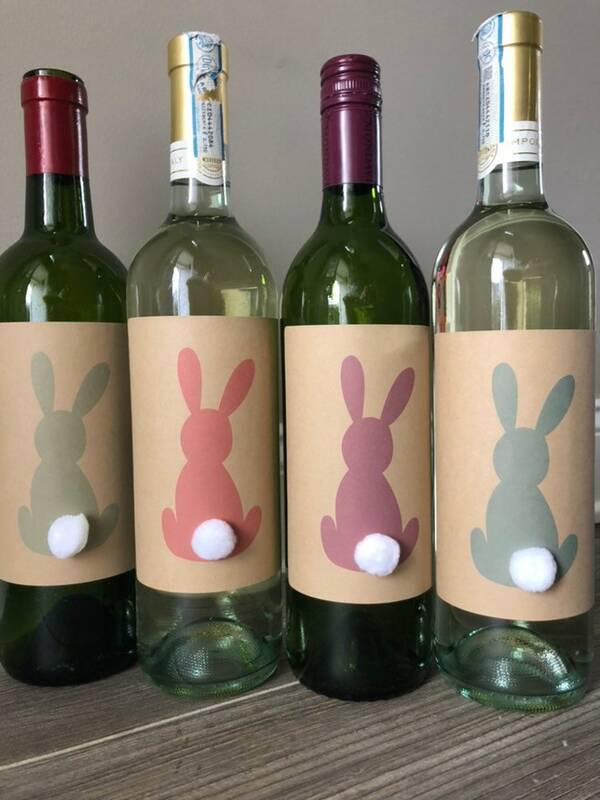 Easter Kraft POMPOM Bunny Wine Labels are sold in sheets. Printed on precut high quality kraft labels that each measure 4” wide by 5" high. 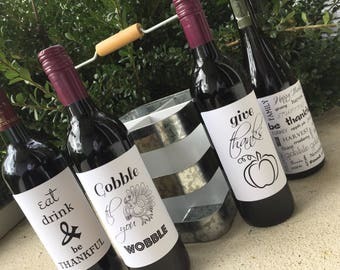 JUST PEEL & STICK to your favorite bottle of wine! ► Each set is MADE TO ORDER. ► FOR BEST REULTS I recommend removing original bottle label. Instructions for removing existing labels from your bottles is included in your order. ► DO NOT HESITATE TO MESSAGE ME WITH ANY QUESTIONS!! These are the cutest! The labels went on the bottles so easily without any wrinkles. I’m excited to give these to my mom and sisters for Easter. Would order from this seller again! The labels were great! She customized them for me by added the event title and date! Loved this! Such a cute idea and easy to do. Labels big enough to cover the original wine label on the bottle. As soon as payment has been received you can expect us to begin working on your purchase! We typically begin preparing files for print once received. We strive to get your orders out to you as soon as possible. This is why many of our items do not come with a digital proof. We are ALWAYS more than happy to send you a proof of your item as long as stated in NOTES TO SELLER at checkout. Please request PROOF REQUEST. Thank you! Because most of our items are personalized, we do not accept returns and exchanges. Although if, for any reason, you are not happy with the item you have received, please let us know AS SOON AS you receive your items. If we do agree on a return (for non-personalized items) the return shipping is the buyers responsibility and NMTM Designs is not responsible for return shipping charges. Please ALWAYS inspect your items the day they are delivered to make sure everything is accurate and was delivered safely. Please message us if you have any questions or concerns! Accidents and mistakes can happen to either sellers or buyers, after all, we are human! Whatever the situation is, don't hesitate to reach out! Our goal is for you to have a great customer experience and be 100% satisfied. We love what we do and we love to see our customers happy! We typically begin to prepare your item as soon as it is received, cancellations are not always possible after your order has been processed. Upgrades to Priority & Express Mail are available for most items at checkout. Please note these times are additional to processing times. Check individual listings for processing times. Most of our items ship first class unless chosen otherwise at checkout. Quoted USPS times are an estimate, and are not guaranteed. USPS is typically reliable. Sometimes a package can get held up or during bad weather, the holiday season or other times of heavy demand delivery times can vary. we do our best to get each and every one of your orders out ASAP. Please check individual Items for their processing times - these time frames are before shipment. Please add time on after shipment for your items to be delivered to you. NMTMdesigns CANNOT guarantee any delivery dates. Once item is shipped, it becomes the RESPONSIBILITY of the USPS and NMTMdesigns is NOT liable for any late deliveries. For all inquiries on delivery once shipped, please check your tracking information and contact the USPS. INTERNATIONAL CUSTOMERS- NMTM Designs is not responsible for any Customs Taxes once your item has reached its destination. Please be available via Etsy Convo for information about your purchase! I may have a question about your order, or your shipping address... Please always check your email on file with etsy and always check to be sure we are able to contact you if we need! DIGITAL PROOFS- Not every item in our shop we send a digital proof for approval. This is so we can get your item out as quickly as possible to you. Some items we always send a proof. Please read product description for the item you are purchasing. If you would like a digital proof but we don't automatically offer it, we are ALWAYS MORE THAN HAPPY to send a digital proof of your item if requested. IF you would like a digital proof of your order we are more than happy to do so - PLEASE leave a message in notes to seller upon checkout and we will be happy to send a digital proof of your order before printing. Once approved we can begin printing. Please keep an eye out for a message on ETSY for your proof. If we have not heard back from you approving your proof within ONE WEEK your order will ship as is. Thank you for shopping with NMTMdesigns! & please let us know if you have any questions! All of our items are made to order! Our production times range depending on the item ordered. In most cases we are able to prepare and ship most orders within a day or two, which is typically sooner than the stated time frame. However, there are some orders that do require more time to process, especially when we have a high volume coming in. Please check individual listings for shipping time frame. If you need something for a specific event. It is always a good idea to message us before purchase so we know, or make a note in notes to seller the date it is needed by. We can TRY to get your order out. If you need something right away it is best to message before to make sure we are able to get it out for your event. Please understand once a package leaves our hands it is out of our control. You can always visit USPS.com or call them at 1 (800) 275-8777 with tracking info. If you still have a question about an order or you haven't received your order please feel free to message us! For BEST results ALWAYS remove original wine label and make sure bottle is smooth, clean and dry. Measure from the bottom of the bottle so all labels are at an even height. Use the side seam of the bottle as a guide so the labels are applied straight. Slowly apply label, smoothing it as you roll. 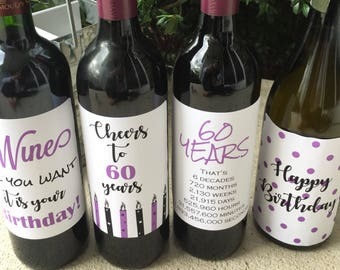 If you do not remove the original able or you do not measure the bottle to make sure the label will fit before the bottle begins to curve for the bottle neck, label wrinkling may occur. While every effort has been made to ensure the accuracy of color representation, actual color may vary slightly due to differences in the lighting, settings of monitors, software, and paper dye lots. If you have a specific date that the item is needed for, please let us know. While we can not guarantee delivery dates within the USPS, we can try to get your product in the mail as quickly as possible for you IF we know BEFORE you order. So please message us so we know before your purchase and we can make arrangements to get your order out ASAP. All of our products are made to order, therefore we do not allow any cancellations once your order has been placed. Please make sure to check our processing and shipping times before ordering. And send us any questions you have before placing your order! We are always more than happy to answer them!